According to foreign media reports, Vtoken, the world's largest decentralized exchange, will launch Paydex, a new cryptocurrency payment tool this year. 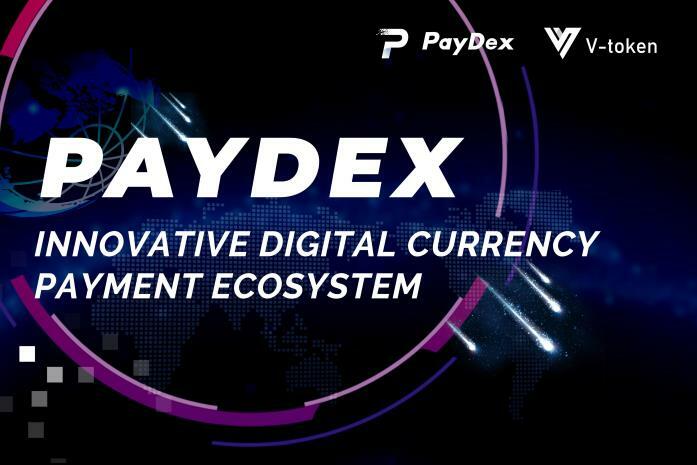 From relevant information, we can find that Paydex's application and innovation in technology will provide new ideas for the development of digital payment tools. From the official information, you can see that Paydex (V payment) is the core cryptocurrencies payment channel created by the original team of Vtoken founding team. Based on the core technology of the public chain, it provides worldwide users with payments for all cryptocurrencies, such as Vtoken, VPC, USDT, VRT, YEC, EOS, LTC, VUST, etc., it will also support the circulation and payment of digital assets in V-tokens, as well as global settlements based on cryptocurrencies. Under the support of V-token's blockchain core technology, Paydex implements a limited real-name system to ensure the security of funds while providing sufficient anonymity. At the same time, global payment results are confirmed in real time without network congestion. In terms of technical advantages, Paydex adopts the Proof of Burn consensus mechanism in the Vtoken core technology. Through the super node, each user can easily and fairly query the chain browser to achieve asset transparency and reject false accounts. Each user is a clearing gateway that enables global distributed clearing across all currencies in a cross-border manner. Each clearing gateway is an acceptor and can be profitable through circulation replacement. Providing a payment SDK for the merchant, the QR code can be collected on the merchant website and the payment result and the automatic delivery can be returned, and all the application scenarios of the global mall can be linked and paid. From the above we can see several key pieces of information: the Proof of Burn consensus mechanism, the chain browser query. So, what is the Proof of Burn consensus mechanism? What are the functions of browser queries on the chain? To understand the Paydex Proof of Burn consensus mechanism, we must first understand what is the consensus mechanism. The consensus mechanism helps the blockchain reduce the cost of establishing trust and realize the value of the Internet. To put it simply, the consensus mechanism is to make multiple participants agree to a result, and participants who have no central control and no mutual trust base, and finally agree to a result, this process is called consensus mechanism. At present, the mainstream consensus mechanisms include PoW mechanism, PoS mechanism and DPoS mechanism, in addition to such as dBFT mechanism, PBFT mechanism, DAG mechanism, PoA mechanism and so on. PoW is Proof of Work. Its advantage is that the algorithm is simple and destroy the system needs to be very costly. The disadvantage is that there is no finality and it wastes a lot of energy. Many people criticize it for wasting a lot of computing power. PoS is a Proof of Stake. Its advantage is that it doesn’t waste too much energy. The disadvantage is that it will bring fork, many people criticize it will Matthew Effect. DPoS is Delegated Proof of Stake, a share authorization certificate. It specializes the role of the bookkeeper in the PoS, selects the bookkeeper through the equity, and then take the records among the bookkeepers. The disadvantage is that the final problem is still not solved. Proof of Burn is called PoB. In the Paydex system, the Proof of Burn mechanism is the basis for transaction security, value, fairness and trust. In order to obtain a new cryptocurrency, the user must "burn" (destroy) another currency, such as bitcoin. In theory, this will make each new cryptocurrency worth the value of the destroyed coin, but in reality, the user can't really destroy the cryptocurrency, the system needs the user to send it to an address that will reduce the total supply. In this safe and efficient consensus mechanism, the user achieves the purpose of burning the cryptocurrency by sending the cryptocurrency to an address that cannot use the cryptocurrency, since the "burning proof" transaction record is written into the block, these records can be used as evidence that "the cryptocurrency can no longer be used", and the user can get other cryptocurrencies as a reward after burning the cryptocurrency. The Proof of Burn Consensus Mechanism provides a proof system for identifying value creation, a way to pay transaction fees, and a new way of paying dividends to shareholders. Under the Vtoken Proof of Burn consensus mechanism, users can create their own cryptocurrency through the legal means of "burning proof". By locking the relevant cryptocurrencies in such an address indefinitely, some legal problems can be avoided. Paydex effectively integrates the advantages of the Proof of Burn consensus mechanism in the payment field. At the same time, it realizes the transfer of the value of the payment, confirms the transaction through the consensus mechanism, avoids double payment, and reduces the cost of the user as a way to pay the transaction fee. Chain browser query is coexisting with the Proof of Burn consensus mechanism. Paydex allows each user to easily and fairly query on the chain through the super node. The content recorded in each block can be viewed and checked from the blockchain browser, to effectively achieve asset transparency, and reject false accounts. The Paydex Clearing Gateway uses Vtoken public chain technology developed by the original Ripple founding team. It combines Ripple, Stellar and graphene underlying technology. It is a banking system like Stellar between fiat and cryptocurrencies. The transaction gateway has an ultra-high TPS value (transaction speed), which is better than the EOS processing speed. It is the most suitable blockchain technology for the payment gateway in the underlying technology.